The Fixed Export Limit in your SP PRO GO inverter will give the Utility assurance that your battery based Solar Hybrid system will not export more than your allowable power to the electricity grid. 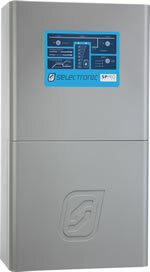 This limit is regardless of the size of the SP PRO GO inverter, the configuration settings within the SP PRO GO inverter or the amount of Managed AC Coupled solar or DC coupled solar. When used with Managed AC coupled solar and/or DC coupled solar, any solar power in excess of the Fixed Export Limit will be used to charge the batteries or run the loads. If the excess solar power cannot be consumed, then the SP PRO GO will reduce the generation of solar power to ensure that the Fixed Export Limit is never exceeded. Generic AC coupled solar power (or other AC coupled renewable source) up to the Fixed Export Limit may be used but any power in excess of this must be either Managed AC coupled or DC coupled. If any Generic AC coupled solar or renewable exceeds the Export Power Limit, the SP PRO GO will disconnect from the grid and ramp its frequency, causing the generic AC coupled inverter to disconnect. This ensures that the Fixed Export Limit is never exceeded, even with generic AC coupling. The Fixed Export Limit is expressed in the last part of the SP PRO GO model number. For example, a SPMC482-4.0 will have a rating of 4.0 kW. Utility is guaranteed that the required grid export power limit is not exceeded. The Fixed Export Limit cannot be changed by the installer or user. The user can adjust export power limits within the SP PRO GO up to less than the Fixed Export Limit as and when required. Works with a variety of renewable energy sources including PV solar, micro hydro and wind. When using Managed AC coupled solar and a Selectronic Certified grid-tie inverter, solar power can be up to twice the rating of the SP PRO GO inverter. Can use Generic AC coupled solar up to the Fixed Export Limit.